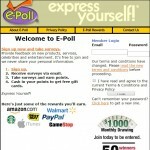 “E-Poll Market Research” (or Epoll), by Gerry Philpott and found at epollsurveys.com, is a market research company started in 1997, and has a unique twist in that much of the research is focused on the entertainment industry. The paid surveys company that operates E-Poll is Bridge Entertainment Inc., which is accredited by the Better Business Bureau. For people who are interested in surveys and would like sharing their opinions on celebrities and entertainment, E-Poll could be one of the more interesting companies if not lucrative… but of course the money you would expect to make with any survey company is not a large amount. E-Poll does research in other areas as well, but their President and founder – Gerry Philpott – has over 30 years in the television and media industry, so a large focus is on entertainment. It used to be that compensation came in the form of gift cards at many major retailers like Amazon.com, Target, Best Buy, Starbucks, and itunes; but E-Poll recently added a Paypal deposit option as well. The compensation works as follows: 3,500 points is worth $5, which is the minimum amount you need to earn to get a gift card or a Paypal deposit. But $6,750 points is valued at $10, and $12,500 is $20. So with E-Poll you make a bit more money per point if you accrue a bigger balance. Your points don’t expire as long as you take one survey in a year, so you don’t have to worry much about losing them. You usually get paid withing 6-8 weeks. There is also a monthly drawing for members, with 40 prizes of $25 each. E-Poll says you can expect to get around one survey every 4-6 weeks, but that is of course different for everyone and it does appear many members say they often get to take at least several more than that. Most surveys appear to fall in the 200-1,000 point rage, but of course that too can vary. It does appear most members of E-Poll are fairly happy with the company – especially the fact so much of it is involved with the entertainment industry… that is of course interesting to many people. They do pay, even if it takes awhile to receive the money/certificates. And for many the low threshold for payment – $5 – is a bonus too. E-Poll is a legitimate survey company which is involved with an industry that can make the “job” more interesting to some people. You won’t make a lot of money with E-Poll or any other survey company, but E-Poll can be an appealing option for people who enjoy the unique subject matter.